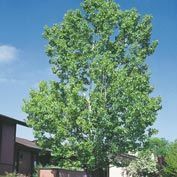 Hybrid Poplar | Gurney's Seed & Nursery Co. Provides outstanding shade in a hurry! 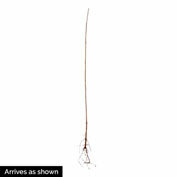 Grows 5-8 ft. every year until reaching mature 50-ft. height. Puts out plenty of side branches. Glossy foliage turns golden in fall. Resists cold, pests and disease. Thrives in most soils and climates. Zones 3-8. Spacing: 12 feet as a wind-break, 50 feet as a specimen tree. Depth: Plant at stain on trunk. Spread: 25 - 35 feet. Soil Requirements: Any soil type including sandy, rocky, dry or moist. Growth Rate: Fast growth rate. Up to 8 feet per year. Pruning: Best pruning time is late Winter. Comments: Plant away from waterlines, sidewalks, etc. as roots are invasive. Soak roots for a couple of hours before planting. Incorporate generous amounts of peat moss, compost, or well-rotted manure into the soil. Prone to ice damage. Commonly lives 20 - 30 years. (Fairly short lived). Water deeply once per week when rainfall is scanty. Very fast growing. Somewhat columnar shaped. Great planted as a windbreak. More insect and disease resistant than regular poplars. 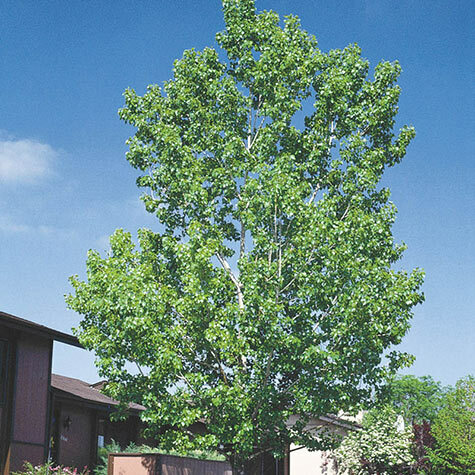 Can be used as a shade tree, or as a screen. Drought, salt, and pollution tolerantt. RESTRICTED STATES, AE, AK, GU, HI, PR.